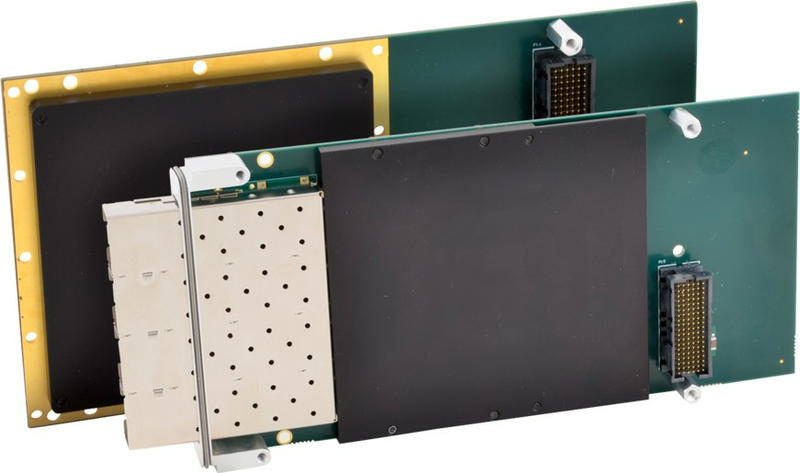 Convection and conduction-cooled versions of this 10GbE Network Interface Card (NIC) mezzanine module are available offering front or backplane connections to Intel's XL710 Ethernet Controller. Wixom, MI – Acromag’s new XMC630 Series modules offer up to four independent 10-gigabit Ethernet interface ports. The XMC mezzanine card mounts on VME, VPX, PCIe and other embedded computing carrier boards. An industry-leading Intel® XL710 Ethernet Controller provides high-performance network connectivity with advanced off-load and virtualization capabilities. Two models are available. The air-cooled XMC631 model has four SFP+ connectors on the front panel for fiber optic or copper media transceivers. The rear I/O model XMC632 routes two XAUI interfaces to the P16 connector and is compatible with conduction-cooling frames. Optional VITA 61 connectors enable PCI Express 3.0 data rates across eight high-speed serial lanes on the XMC P15 connector. Designed for COTS applications, these XMC modules are ideal for use in defense, aerospace, industrial, and scientific research computing systems. Extended temperature operation is supported for -40 to 85°C. Employing Intel’s advanced XL710 4-port 10-gigabit Ethernet controller, these XMC modules optimize network performance with intelligent off-loading, innovative virtualization, and advanced traffic direction. When paired with a Xeon-D processor, the two Intel devices provide a balanced hybrid solution of compute and off-load to achieve optimal performance and reduce bottlenecks. For example, with TCP stateless off-loads, the XL710 demonstrates leading performance vs. TOE solutions without restricting feature usage. Other features include precision timing, Energy Efficient Ethernet (EEE), and dynamic load balancing. Advanced traffic steering capabilities increase transaction rates and reduce latency.